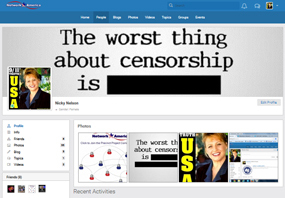 Create a Profile, add friends, send private messages, add photos and videos and More! Join the National, State, County, Party and other Groups; Join others who share your passion for freedom. 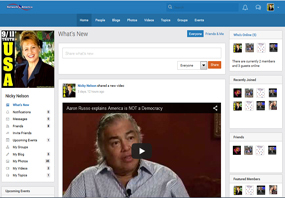 Stay up to date on the latest news, organize meetings, strategies, and social events while keeping in contact. 6. 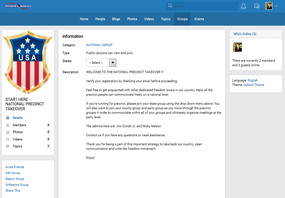 Join your Party (or other) Groups or make your own groups! There are links in each group that lead you to the next. 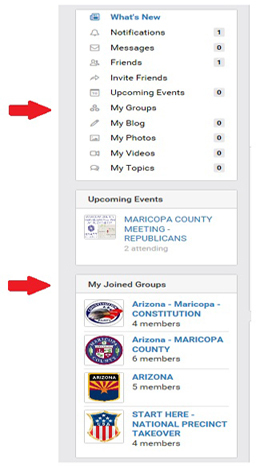 Once you have joined all of your groups, you will have a list of your joined groups easily accessible in the future; see example. Thank you for being here, enjoy!